"Vassili Vassilyevich Nebolsin (30 May 1898 - 29 October 1958) was a Russian conductor. He studied at the college of the Moscow Philharmonic and became conductor of the orchestra in 1918. He became choir master of the Bolshoi in 1920 and its conductor in 1922. He taught at the Moscow Conservatory from 1940 to 1945. The Stalin Prize was awarded him in 1950. Born with a German name, Ivan Petrov assumed the role of quintessential Russian bass during the age between Mark Reizen and Alexander Pirogov and Evgeny Nesterenko, who followed a generation after. Endowed with a generous instrument -- solid, long-ranged, and refined -- Petrov attained first rank among the low-voiced singers at Moscow's Bolshoi and held his position for more than two decades. The onset of diabetes caused his retirement at age 50, but not before he had left an imposing recorded legacy. Petrov's family were naturalized Germans, resident in Russia under the name of Krause for several generations. His father had descended from a tradition of engineers and scientists, but singing, too, had been an integral aspect in the succeeding generations of the Krause family. After a childhood in Siberia during which he spent in his favorite pastimes of volleyball and football, Johann Krause moved with his parents to Moscow in 1936. The specter of German ambition overshadowed the Soviet Union at the time and those bearing German surnames were suspect. Hence, the family chose a new name and the teenager became known as Ivan Petrov. Through his studies at the Moscow Conservatory, Petrov's bass voice began growing noticeably in size and compass. At age 19, he was already working on arias of advanced difficulty; the following year, he was engaged by tenor Ivan Kozlovsky and the Moscow Philharmonic Society. He joined the ensemble in tours of operas presented in concert format. In 1941 alone, after his country was under attack by Germany, Petrov participated in many of the hundreds of performances given for soldiers both on front lines and recuperating in hospitals. In 1942, Petrov auditioned for the Bolshoi Theater and was engaged, becoming a member of the Soviet Union's most prestigious opera theater at the age of 22. In 1947, Petrov was a member of a delegation of young Russian artists sent to the First World Youth Festival in Prague and won a gold medal. Budapest, too, acknowledged his qualities as a singer when he appeared there in 1949. Despite the presence of more established basses, Petrov made himself known at the Bolshoi, first in small roles, soon thereafter in leading parts. By the 1950s, he had become one of the theater's leading artists. During his distinguished career at Russia's great theater, Petrov won several Stalin Prizes for his work in a repertory that came to embrace some two and a half dozen leading parts. Among his most acclaimed were Boris Godunov, Dosifei in Mussorgsky's KHOVANSHCHINA, Ruslan in Glinka's RUSLAN AND LUDMILLA, Don Basilio, Kochubei in Tchaikovsky's MAZEPPA, Méphistofélés in Gounod's FAUST (his favorite), and King Philip in Verdi's DON CARLO. 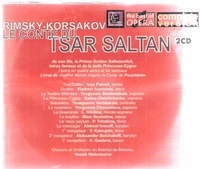 A recording of Verdi's REQUIEM conducted by Igor Markevitch (with soprano Galina Vishnevskaya) demonstrates Petrov's assured sense of Verdian line and dramatic intensity. In 1964, when singing Prince Igor with the Bolshoi at Milan's La Scala, Petrov was honored by the daughter of the famed Russian bass-baritone Feodor Chaliapin when she presented him with a ring her father wore for performances of BORIS GODUNOV. By that time, Petrov had sung the part in venues far afield from his home theater, also offering his Gounod devil in numerous opera houses in Eastern Europe, Scandinavia, and Western Europe. In the years of his prime, the bass also won a positive reputation as a recitalist, appearing with his accompanist of three decades' association, Semyon Stuchevsky." "Galina Oleinichenko was born on 23 January 1928 in the village of Budenovka in the Rozdilna district of Odessa. At the School of Music she studied the harp, and graduated in 1953 from the Odessa Conservatory having studied solo singing under N. Urban. Between 1952 and 1955 she was a soloist at the Odessa Opera and Ballet Theatre and, between 1955 and 1957, she was engaged at the Kiev Opera and Ballet Theatre. Her career at the Bolshoi Theatre began in 1957 where she remained until 1981. Her repertoire at the Bolshoi included the roles of Lyudmila (RUSLAN AND LYUDMILA) Gilda, Violetta, Lyudmila, Karolka, The Swan Princess (THE TALE OF TSAR SALTAN which she recorded under Nebolsin (above), Antonida, Rosina, Volkhova, the Snowmaiden and Titania (in Britten's A MIDSUMMER NIGHT'S DREAM), singing opposite Obraztsova's Oberon). She recorded romances by Tchaikovsky, Rimsky-Korsakov, Rachmaninov, Liszt and Delibes as well as a selection of opera arias for Melodiya and lent her voice to the eponymous heroines in the filmed operas IOLANTA (Tchaikovsky, 1963), SEVIL (Amirov, 1970) and sang the role of Marfa in THE TSARS BRIDE (1966) and soprano arias in THE MUSIC OF VERDI (1963). The conductor, Boris Khaikin wrote of her 'Oleinichenko's singing is especially captivating with an evenness of sound and accuracy of intonation, and she was in constant pursuit of expression and an understanding of the characters that she portrayed'. After her retirement she also taught, becoming a Professor at the Russian Academy of Music(Gnesin) in 1999. She passed away on 13 October, 2013, aged 86."